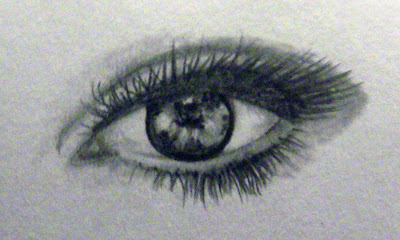 eye... love eyes. Can you tell lol. I seem to have a fascination with them but I also find I can draw them better when I only have to do one. Think I need to block of the rest of my sketch with a piece of paper with a window in it so that I can concentrate on one eye at a time without being distracted by the bigger picture. Makes no sense I know but I think it will make my faces better. OMG!!! !Gorgeous Chris..you are super uberly talented..Thanks for stoping by!! !Hope you and yours are well....from a very growchy me!!! oh wow Chris this is a stunning eye. This is just stunning, Chris! So perfect! Chriss, you sure have an eye for this sort of thing babes. This especially looks soooo realistic! You've improved your technique beyond belief. Suffice to say, there'll be no eyes on my blog!